Increasing number of people are switching to a vegetarian diet or meat substitute due to the potential health benefits offered. According to the National Health and Nutrition Examination Survey (NHANES), demand for animal products in the US is declining, moreover, sales of plant-based food in the US experienced around 8.1% growth in one year. Along with the rise in a number of vegetarians and vegans, people who are not subscribing to either diet but have reduced meat and dairy consumption are also increasing, thereby, driving the sales in meat substitute market. There has been a shift in a protein source, peas are emerging as the popular choice as the meat substitute owing to gluten-free nature and high protein content. Meanwhile, companies operating in the meat industry are also investing in meat substitute products. This is likely to result in the substantial growth in meat substitute market. Wheat-based meat substitutes are witnessing significant growth in the meat substitute market. Wheat proteins are cost-effective, hence, finding applications in various food products such as nuggets, vegetarian sausages, and burger patties. Increasing use of wheat is making it a highly accepted source of meat substitute. The most popular wheat-based protein produced across meat substitute market is seitan also known as wheat meat, gluten, or wheat gluten, with meat-like texture. Setian is rich in protein and amino acids, making it a healthy meat substitute. However, consumers opting gluten-free diet is emerging as one of the biggest challenges for seitan and other wheat-based meat substitutes in the meat substitute market. As per the findings from the team of researchers at Adelaide University, meat consumption adds to the obesity prevalence globally at the same extent as sugar. A study was conducted to find a correlation between meat consumption and obesity rate in 170 countries and found that after sugar, meat contributed around 13% to obesity. The conclusion was drawn that meat protein in the diet contributes significantly to obesity. The consumption of plant-based foods as a meat substitute is on a rise as it has shown positive results in weight-loss. According to the World Health Organization, worldwide obesity has almost tripled since 1975. In 2016, more than 1.9 billion people, 18 years and above were overweight. Hence, consumers across the world are shifting to plant-based and vegan diet by selecting a meat substitute. Also, companies operating in the meat substitute market are focusing to embed protein-rich ingredients in the products to help lower body fat and fluid lipid. The Food and Agriculture Organization of the UN found that livestock production accounts for around 18% of global greenhouse gas emission. Moreover, urbanization and rising income are resulting in increasing consumption of meat and dairy products. However, in the last few years, various companies in the meat substitute market have started creating genetically modified meat substitutes and animal-free meat. Meat substitute produced using plant protein and artificial meat made from the genetically modified organism are entering the market to compete with conventional meat production and meet increasing demand for meat products. However, the future of artificial meat made through genetic modification is still uncertain in the meat substitute market, owing to the ongoing debate on the safety of genetically modified food. Also, consumers in the US and UK are spending millions on meat substitutes due to environmental, animal welfare, and health concerns. Thus, fueling meat substitute market growth. Reducing meat consumption through substitution is becoming popular across the meat consuming countries. Majority of the players in the meat substitution market are producing artificial meat with genetic modification and are offering plant-based meat substitutes. With growing demand, meat substitute manufacturers need to ensure high quality of meat substitute products for consumers. Manufacturers in the meat substitute market are producing alternative protein source such as seitan, quorn, tempeh, etc. However, various studies have claimed these products harmful to be consumed. For instance, Center for Science in the Public Interest has found some people have an adverse reaction to quorn resulting in difficulty in breathing, vomiting, nausea, and diarrhea. Meanwhile, seitan is a processed vegan protein source high in salt, preservatives, and additives. Governments across the countries are imposing regulations on producing meat substitutes. Meeting all the requirements and standards for quality of meat substitute is adding to the manufacturing cost for meat substitute producers in the global meat substitute market. Major market players in the meat substitute market are employing strategies including new product launches, mergers, and acquisitions, partnerships, conducting surveys and studies. The report on meat substitute market offers detailed profiles of all the leading players along with information on market share of companies and recent developments. Cauldron Foods, a vegetarian and vegan food manufacturer has relaunch a brand in order to capture a younger audience. The company has also redesigned the product packaging. Meanwhile, two new product launches of the company are due in 2019. Morningstar Farms, a company owned by Kellogg has launched new vegan burger patties and also switched its three vegetarian chick’n products to vegan. The switch from vegetarian to vegan was done owing to feedback from customers on lack of vegan options. Many animal-related disease outbreaks that include swine flu and bird flu over the recent past have led consumers across the globe to shift toward a more vegan diet, influencing meat substitute consumption as a result. Trend toward vegan diet is also being supported by surging prevalence of health problems such as diabetes and obesity. Rise in living standards of consumers coupled with their higher GHDI is further posing a positive impact on demand for not-so-cost-effective meat substitutes. R&D initiatives are being undertaken by global leading food product manufacturers, in a bid to develop novel and superior quality meat substitutes to increasing number of health-conscious consumers globally. A new report of Future Market Insights offers forecast and analysis on the meat substitutes market on a global level. The report delivers actual data related to the market for the historical period (2012-2016) along with an estimated intelligence on the market for the forecast period (2017-2026). The information is presented in terms of both value (US$ Mn). Macroeconomic indicators coupled with an outlook on the meat substitutes demand pattern around the world have also been encompassed by the report. 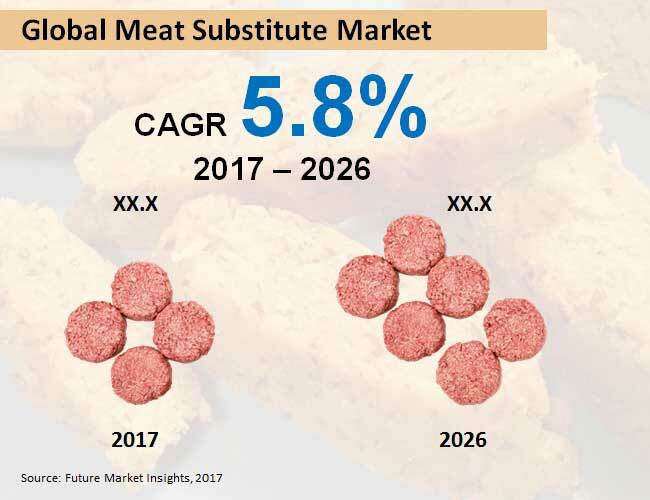 The report further imparts key drivers and restraints for the global meat substitutes market, and their impact on regional segments included over the forecast period. The executive summary chapter, which initiates the report, offers key market dynamics and numbers associated with the global meat substitutes market, along with key research findings related to the market segments comprised. The market numbers included in this chapter are a blend of compound annual growth rates, market shares, revenues, and volume sales. A concise introduction to the meat substitutes market is offered in the chapter succeeding the executive summary, along with a formal definition of “meat substitutes”. Elaboration of the market dynamics that include future prospects, growth limitations & drivers, and trends has been delivered in the chapters subsequent to the overview. These chapters also inundate insights apropos to bottom line of enterprises in detail, along with the fiscal stimulus and the global economy. A complete package of intelligence on leading participants supporting expansion of the global meat substitutes market has been offered in the concluding chapter of this analytical research report. This chapter elucidates the competition landscape of the global market for meat substitutes, providing information on key strategy implementations of the market players, their product overview, key development, company overview, and key financials. A SWOT analysis on each market players has been provided in this chapter of the report. The geographical spread of the market players included, along with their future growth plans, intended mergers & acquisitions, overall revenues, and market shares are elaborated in detail in this chapter. The report has employed an intensity map for portraying key market players located across geographies. Credibility of researched statistics & data is backed by a unique research methodology used by analysts at FMI, ensuring high accuracy. This research report on global meat substitutes market can assist readers in acquiring detailed insights on several aspects that govern the market across the regional segments contained in the report. The report readers can use slated strategies to tap the vital revenue pockets, thereby gaining benefits over intensifying competition prevailing in the market. Intelligence presented in this report has been scrutinized & monitored thoroughly by FMI’s industry experts. The figures and numbers offered by the report are validated by the analysts for facilitating strategic decision making for market players. 11.3.4. Garden Protein International, Inc.